Established in the wake of the Harrying of the North, Skipton Castle evolved into a substantial fortress. Further major upgrades were made in the early fourteenth century when the castle passed into the hands of the Clifford family who, apart from a short period during the Wars of the Roses, owned it for almost 350 years. 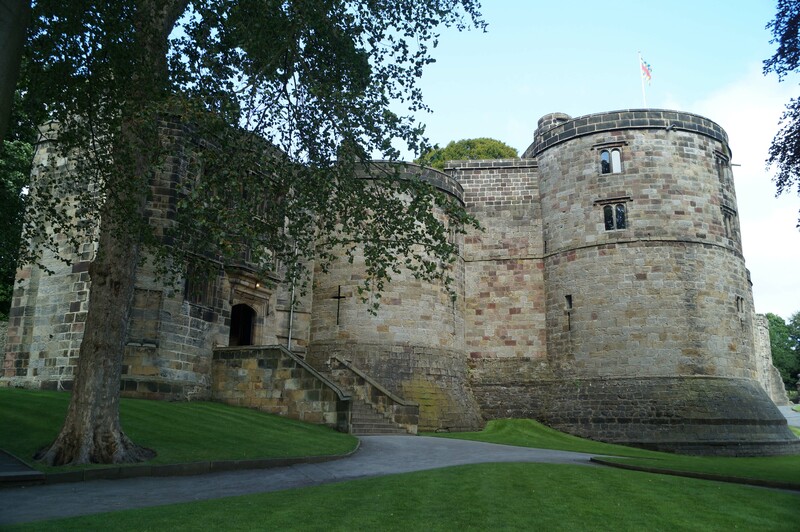 Skipton Castle was established soon after William I's 'Harrying of the North', a brutal campaign conducted in 1069/70 to suppress opposition to Norman rule in Northern England. The initial fortification was built by Robert de Romille and was located on the former Roman road between Ribchester and York, a key route through the otherwise inaccessible Pennines. The precise form of this early castle is unclear due to substantial later modifications but it was probably an earth and timber ringwork-and-bailey fort. It had strong natural defences on the north and north-west where a steep natural scarp and rock-face descended to the Eller Beck. The castle's strategic location meant it regularly became embroiled in the Anglo-Scottish wars of the twelfth and thirteenth centuries and it was rebuilt in stone comparatively early. During this time Skipton passed through the descendants of Robert de Romille but frequently via the female line resulting in its ownership by numerous families - de Meshines, FitzDuncan, le Gros, de Mandeville and de Forz. The final owner from Romille’s line was Aveline de Forz who married Edmund Crouchback, younger son of Henry III. She died in 1274 without an heir and therefore the castle was taken into Royal ownership. In 1307 Edward II granted Skipton Castle to his unpopular favourite, Piers Gaveson, but three years later he was captured, tried and executed by the Earls of Lancaster and Warwick. The castle reverted to the Crown once more and in 1310 was granted to Robert, Lord Clifford. He owned numerous properties in neighbouring Westmorland, including Appleby and Brough castles, which gave him control of the Eden valley, whilst Skipton enabled him to extend his influence east to cover the main route towards York. He commissioned the six drum towers of the Inner Ward although his death at the Battle of Bannockburn (1314) almost certainly means he never saw them completed. Throughout the fifteenth century the Clifford family were strong supporters of the Lancastrian monarchs. John Clifford had fought in Henry V's continental campaigns and was present at the Battle of Agincourt (1415). His son, Thomas, served as representative of Henry VI in Scotland but was killed fighting for the King during the first battle of St Albans (1455). His son, John, sought revenge and at the Battle of Wakefield (1460) it was allegedly Clifford himself who killed Richard, Duke of York. His victory was short-lived for John himself was killed the following year at the Battle of Towton. Thereafter Skipton was confiscated by the Yorkist King Edward IV and granted to William Stanley. He exchanged it for Chirk Castle with Skipton passing to Richard, Duke of Gloucester (later Richard III). The young Henry Clifford, now deposed, was sent into hiding in Threlkeld until the Tudor victory at the Battle of Bosworth Field (1485) which saw his estates and titles restored. Once back in possession he made Skipton Castle his main seat but missed his rural upbringing so much he built Barden Tower. This earned him the title of the Shepherd Lord. The Cliffords prospered under the new Tudor regime and in 1525 the then owner of Skipton - Henry Clifford - was made Earl of Cumberland by Henry VIII. To reflect his new status he made numerous modifications to the castle including adding the Long Galley and the Octagonal tower in 1535. These upgrades transformed it from fortress to palace but, upon the outbreak of the Civil War in 1642, it was hastily re-fortified and garrisoned for the King. It was besieged by a Parliamentary force under Colonel John Lambert in December 1642 but wasn't taken. 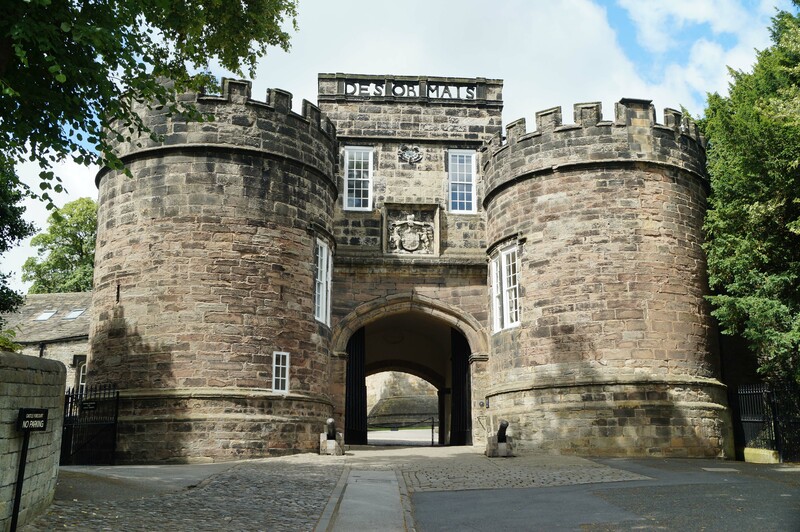 Even following the Royalist defeat at the Battle of Marston Moor (1644), which saw Parliament become dominant in the north, Skipton Castle remained defiant. Only in December 1645 did the garrison finally succumb. 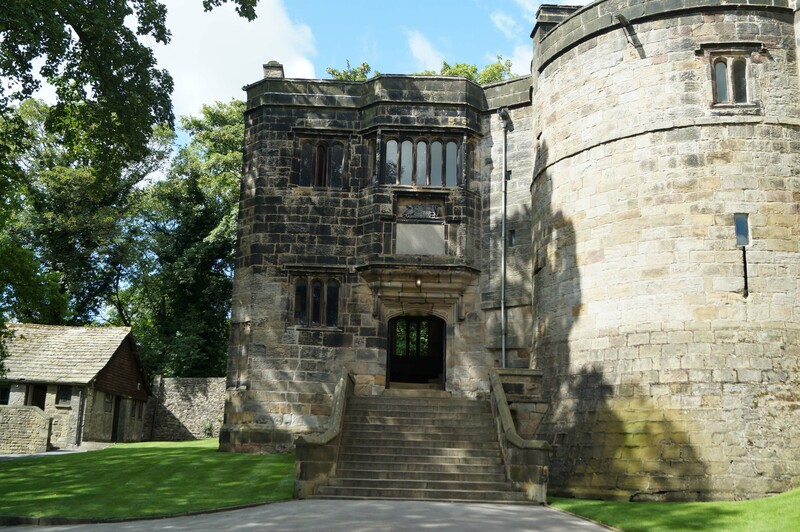 However, in 1648 the Second Civil War broke out and Royalists forces once again reoccupied Skipton Castle. This time Parliament resolved to destroy the castle and ordered it to be slighted. After the wars the castle's owner - Lady Anne Clifford - took back possession of the ruined structure. She commenced a wholesale rebuilding in 1657 although she was required to ensure that the rebuilt defences were cosmetic rather than functional and accordingly the upper walls and roof were deliberately weakened to make them unable to support cannon. Lady Anne also built the elaborate Gatehouse at this time. When she died in 1676, without leaving a male heir, the castle passed out of the Clifford family. Salter, M (2001). The Castles and Tower Houses of Yorkshire. Folly Publications. Skipton Castle was a major medieval fortress that was heavily restored in the seventeenth century after having sustained damage during the Civil War. Today it is a major tourist attraction with the Inner Ward open to the public. The Long Gallery remains a private residence and not accessible. 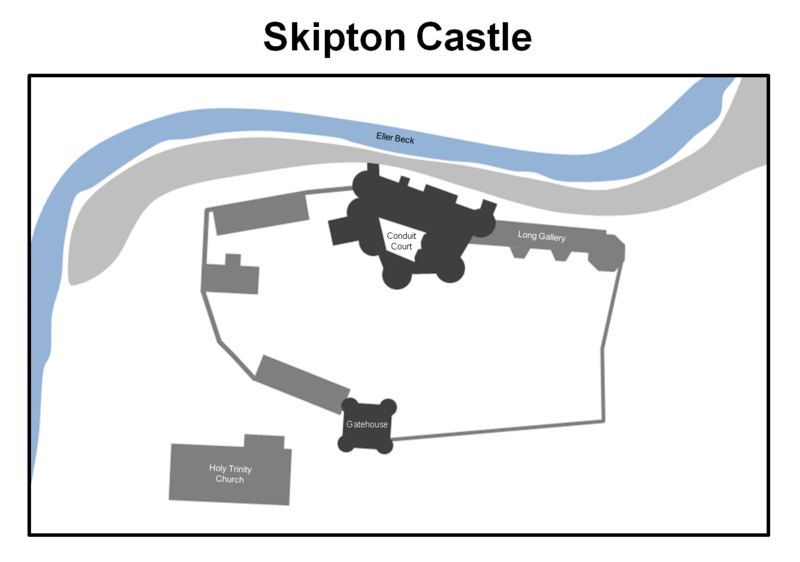 Skipton Castle Layout. The Inner Ward was surrounded by a substantial curtain wall with six drum towers which were built in the early fourteenth century by Robert Clifford. Ranges were constructed against the curtain wall on all sides around a central courtyard. The configuration of the Outer Ward is uncertain due to the substantial rebuilding of the structure although some earthworks survive. Skipton Castle. The drums towers of the Inner Ward, built by Robert Clifford in the early fourteenth century, can be seen to the left. The Octagonal Tower and Long Gallery can be seen to the right and date from the Tudor period. Entrance. The entrance to the Inner Ward was completely rebuilt by Lady Anne Clifford. Conduit Court. 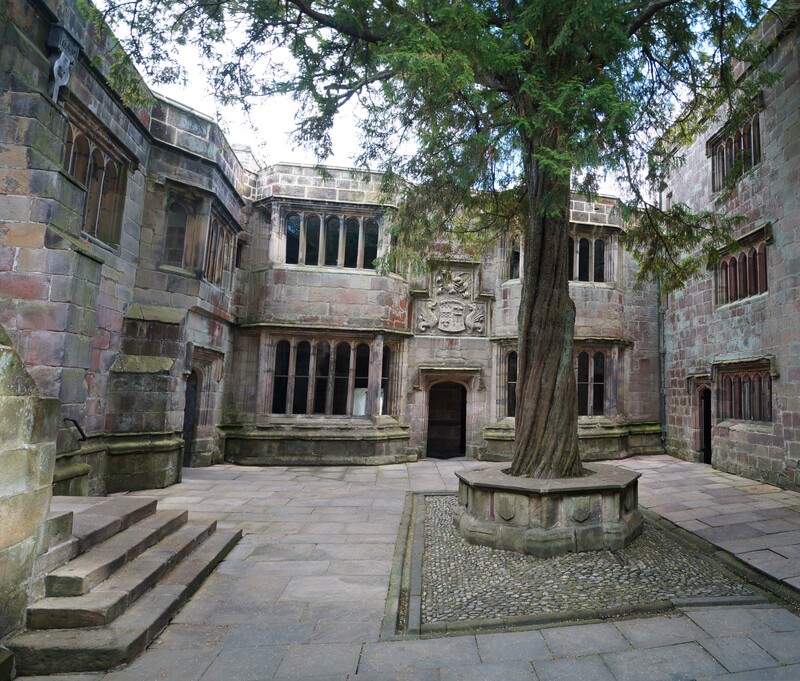 The Yew tree within the courtyard was planted by Lady Anne Clifford in 1659 to mark the castle's repair from its Civil War damage. Banqueting Hall. The Great Hall is located within the North Range in the Inner Ward. Skipton Castle is a major tourist attraction and accordingly well sign-posted. There is no dedicated car park but there are ample facilities in and around the adjacent area. One option is shown below.